I don't even want to think about how many brands I've used and how much money I've handed over in the last 30 odd years, all in pursuit of achieving longer, fuller, stronger, super curled and darker lashes. I could go on and on with a "Wish-list" that both women and men (yes some men have discovered the marvels of mascara) expect from a small cylindrical tube, filled with a pigmented liquid and sometimes an odd looking brush! We truly expect a mascara to do it all. Ask women and most will tell you that mascara would be their no.1 cosmetic choice to take to a desert island and like me, they just can't live without it .... "sans" mascara is a look I just don't do! There are literally hundreds of mascara's on the market, so how do you find the correct one that meets all your wish-list needs and is easy to apply, goes the distance and is removed with very little effort at the end of an exhausted day? Mascara's are a very personal choice and in my opinion it's a case of trial and error until you find the "One"...it's as simple as that. 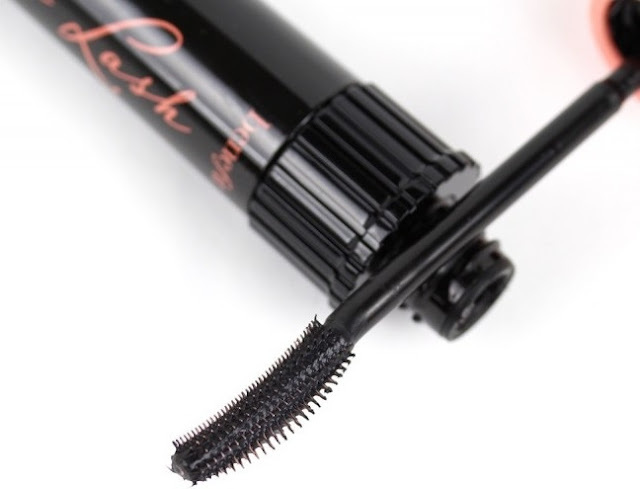 On many occasions I had thought I had found the "Best" mascara, but it was soon knocked off its pedestal, as up pops the next best brush, new formula,lengthening fibers and on it goes. 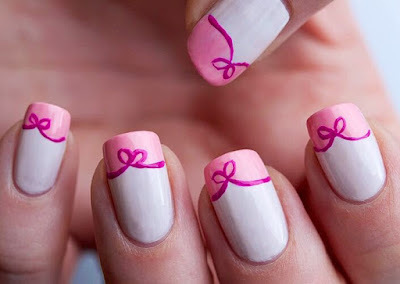 For me the brush is important, as it must be on the short side, precise and well balanced in my fingers. The formula should be moist, but not too wet that it creates those irritating splodges, however the real test is unique to only "Moi", as I have 5 or 6 lashes on my one upper eyelid that without fail, clump together when I apply most mascaras. 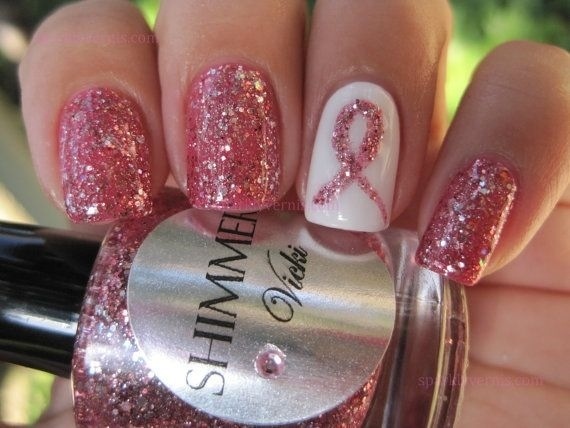 Luckily for me and many other delighted fans, benefit cosmetics returned to South Africa this past July. I had heard about the recently launched Roller Lash Mascara, as it has received high praise from beauty guru's around the world.. but was it really worthy of all the hype, I decided to put it to my "clump free" test. The wand does look slightly different due to the Hook ‘n’ Roll™ brush which not only grabs, lifts, curls but successfully separates the lashes - even my clump! I found it extremely easy to remove and I was happy to read that it contains Provitamin B5 and Serin, ingredients both known for their lash-conditioning benefits. I haven't yet put it to the "cry test" , but it's water-resistant. 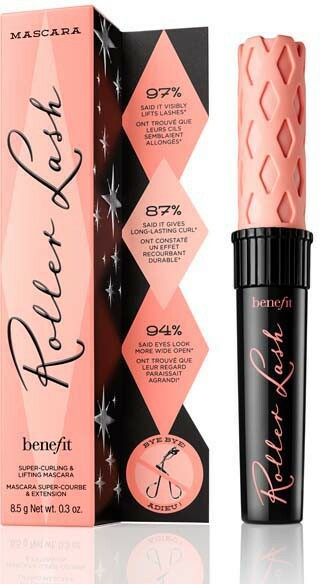 If you are looking for Super,Super curl and length, benefit recommend you to apply Roller Lash first to curl & lift your lashes then layer "they're real!" lenghtening mascara over the top. Sorry for the delay with announcing the 5 winners of my little L'Occitane giveaway, but my computer decided to go on strike for 2 days, not sure if its trying to tell me something! Thank you to all those that entered. 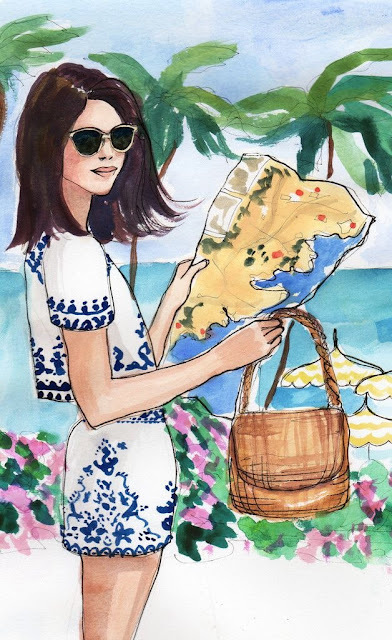 that Summer Is On Its Way. 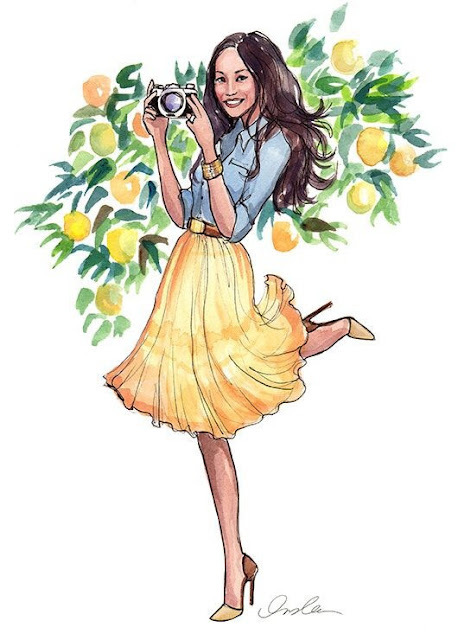 It's no secret that I love the French brand L'Occitane and I am really fortunate to have visited, on several occasions, the birth place of these wonderful products, Provence in the South of France. 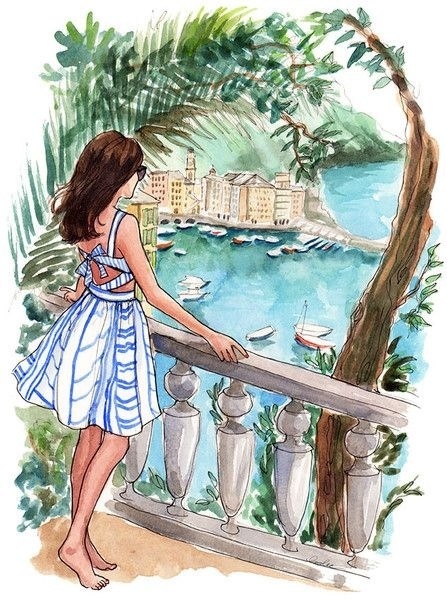 When a new product or range is launched I can't stop my mind and thoughts wandering back to that beautiful part of France, particularly so this month, as they have added (just in time summer) 2 new Youthful Body products to their already successful Almond Body range. If you haven't heard about or used their top selling almond body product - Almond Shower Oil, then you really must read my review, as it's a great product to acquaint yourself with the wonders of the humble "Almond". Here's a little history to this tree and its fruit. The almond tree is actually native to the Middle East and over the centuries it became a prominent feature on the Provencal landscape. 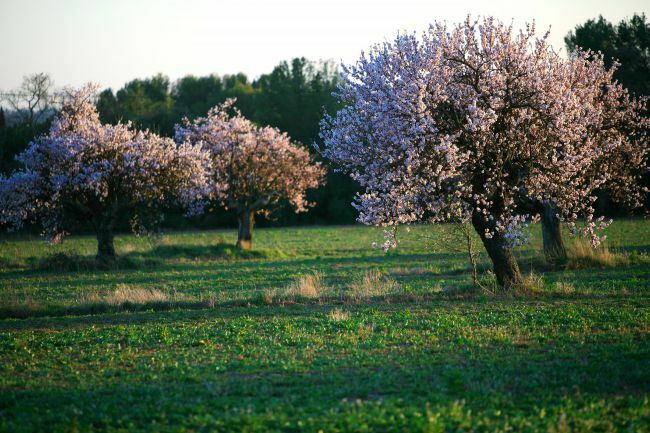 Unfortunately around the 1930's the fields of Almond trees almost disappeared as they made way for more lucrative crops, but thanks to L'Occitanes commitment to purchase the almonds from the producers, the pretty pinkish white flowers that herald the arrival of Spring will once again become a feature of the region. The Valensole plateau in the "Haute Provence" region is where you will find the orchards of almond trees. 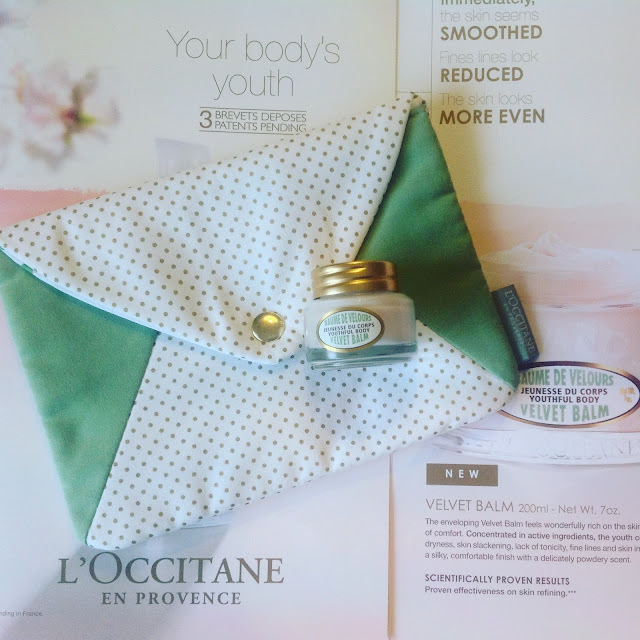 The beauty benefits of the amazing almond nut dates back to Ancient times, so it's not a new discovery, but L'Occitane have, in my opinion, created the most comprehensive and effective body range utilizing the stimulating bud, the fruit and its shell. The nut releases a creamy oil rich in vitamins A and E, renowned for deeply penetrating the skin to intensively moisturise, soften and firm. The shells can be finely ground for inclusion in gentle body or face exfoliators. The Almond nut not only packs a powerful source of nutrients when eaten, but has great antioxidant benefits for the skin and body. 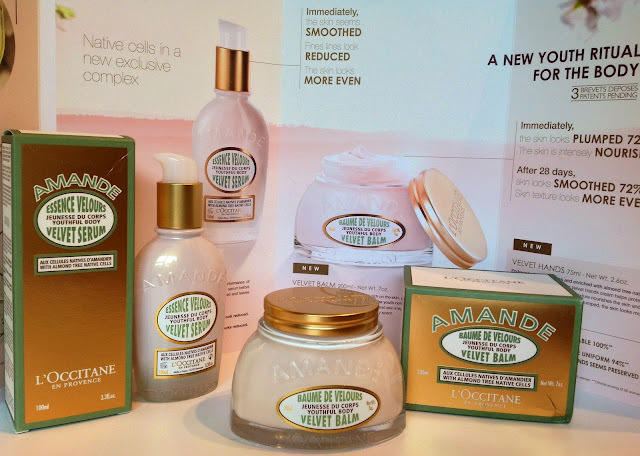 All of this "goodness" has been captured in the latest 2 additions to the Almond range. However all is not what it seems as L'Occitane have discovered a new exclusive regenerating complex. 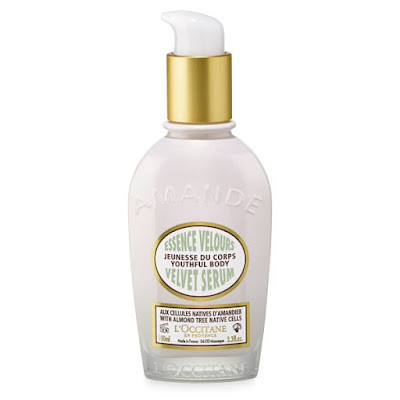 At the end of winter the native cells of the almond tree trigger the bud renewal process and drawing upon the regenerating power of these Native Cells the L'Occitane laboratory have created a new youth complex to help renew and revitalize epidermal cells. Good news as there are 3 Patents pending in France, which gives you an indication of what a discovery this is. What I will reveal now, is that I have only been using these Youth Therapy products for 2 weeks and already I can feel a softness and an increase in hydration of my skin that has impressed me thus far. 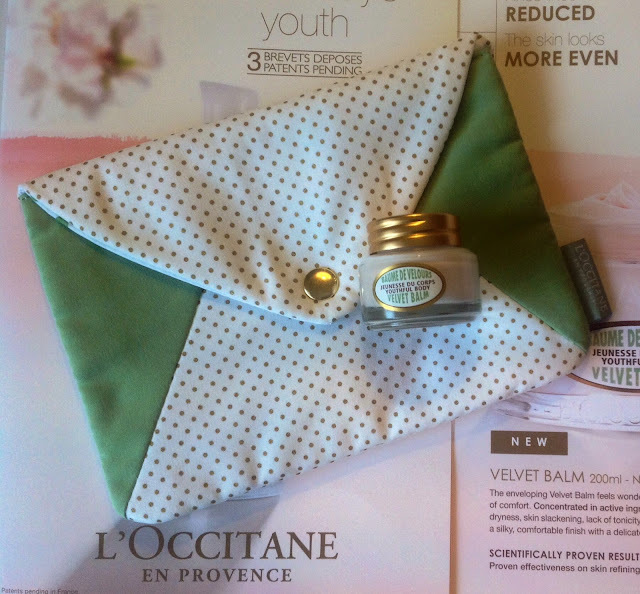 Until I post my full reviews , here is a brief overview of the Velvet Balm and the Velvet Serum. However I would suggest that you pop into your nearest L'Occitane Boutique to feel the texture of these two products, as they are amazing! The Velvet Balm offers an immediate rich comfort to the skin. Apply twice a day on the entire body, massaging into the skin with circular upward motions. The Velvet Serum differs from the Balm as it includes a Vitamin C derivative, which will even out the skin and targets any sun induced sun spots. Apply twice a day to the whole body, especially areas exposed to external aggressions i.e. neckline and the arms. 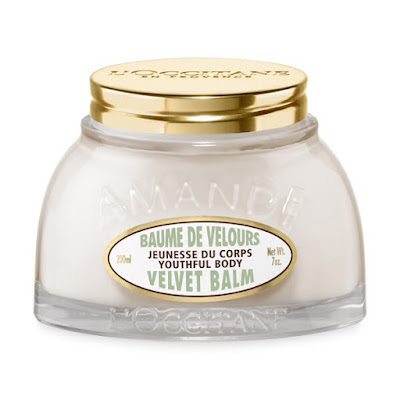 Use alone or before the Velvet Balm for greater effectiveness. Available now at L'Occitane Boutiques around the country and online. just follow the easy Rafflecopter entry below. 1. This draw is only open to those of you that reside in South Africa..sorry. 2. The random draw will take place on Tuesday 27th October. 4. Rafflecopter decision is final. 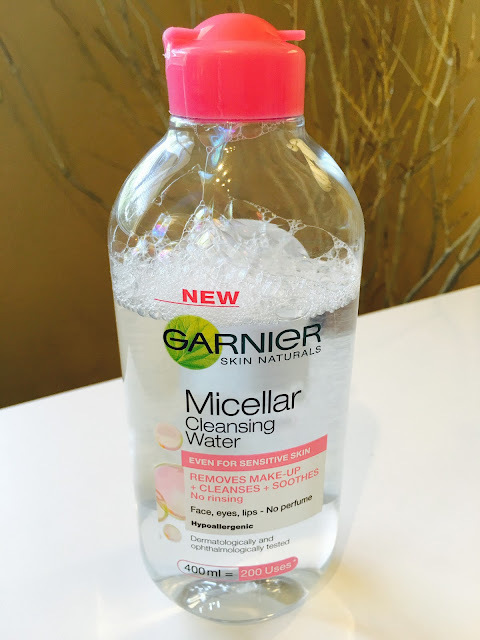 "Oh no...not another Garnier Micellar Cleansing Water review"
a fifty year old beauty blogger. all without having to remove or rinse off. How can one product achieve so much...Well it's all down to the Garnier Micellar technology in this all-in-one cleanser. them away from skin, leaving it perfectly cleansed and refreshed. 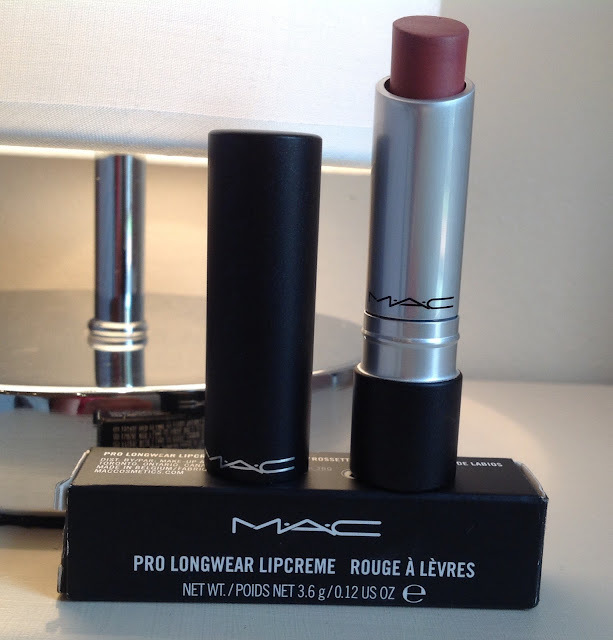 the first use I was convinced that this product does "do it all" and convincingly so! and I have no complaints. I'm not complaining, as it's worth every cent. we can buy are far more expensive for far less quantity. I said earlier that I had no complaints, but I do have one! It is difficult to control the amount that you dispense onto the cotton pad, so just be aware otherwise your bottle wont last for any where near 200 uses. version soon, so I am curious to see how it works on a typical teenagers skin. This stunning Estée Lauder Blockbuster 2015 is now available in South Africa. As always stocks are limited and it retails for R1,600 if you order online and there is no qualifying purchase, however if you buy it from a store it retails for R1,195 with a purchase of a 50ml or larger fragrance so don't delay to nab yourself this wonderful offer. By far the biggest Blockbuster to date, this beautiful collection includes three full-size lipsticks, Repair Serum and so much more, all in a deluxe travel case. Every year I write a post about the Estee Lauder Blockbuster, as I've been a loyal fan ever since I got my first one more than 35 years ago! There isn't one colour in the eyeshadow or blusher palettes that I wouldn't use and the lipstick selection is pretty good to. 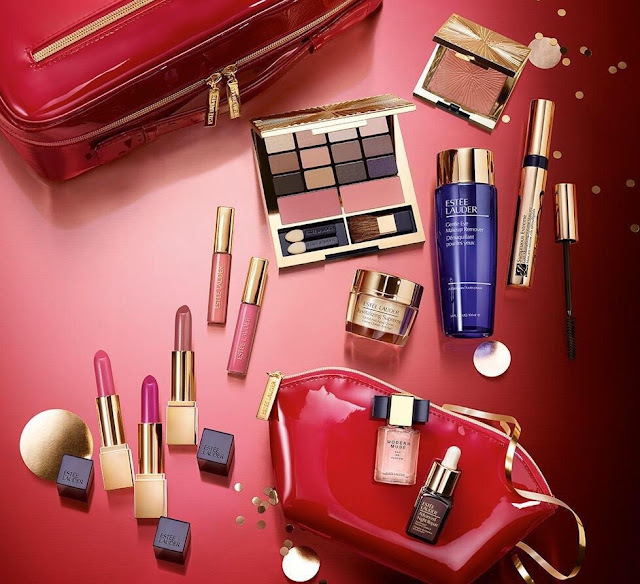 The Estée Lauder Blockbuster 2015 is personally my favourite to date and who wouldn't love to receive this "all you need" make up collection as a gift this festive season! Dermaceutic is most probably a new name to many of you, as it was with me, up until last year. Here is some background to this cosmeceutical brand. Dermatologists and surgeons specialising in facial rejuvenation wanted to offer technologically advanced skin care products for their patients, to accompany general medical and cosmetic procedures. Their research led to the development of Dermaceutic – a range of cosmeceuticals to prepare, optimise and maintain the results of all medical and cosmetic procedures. Dermaceutic Laboratoire is the partner of choice for over 30,000 aesthetic dermatology specialists throughout the world. Dermaceutic stockists are carefully selected and it is imperative that they fill very strict criteria, that criteria being there is an associated doctor within every Dermaceutic Clinic. It was created to address most skin types’ needs - from pigmentation to fine lines to acne - and contains a unique combination of active ingredients. 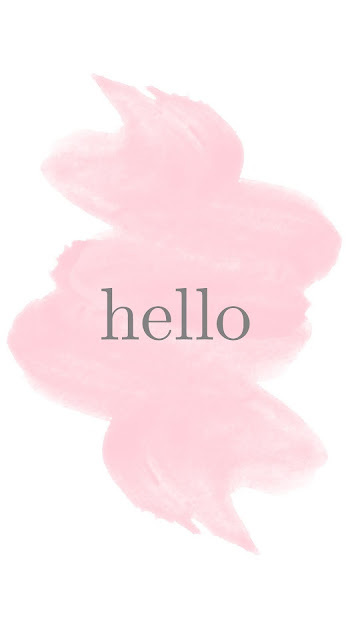 Interestingly Dermaceutics is one of the first cosmeceutical companies to develop products using wonderful ingredients such as hyaluronic acid, stabilized vitamin C, and glycolic acid. 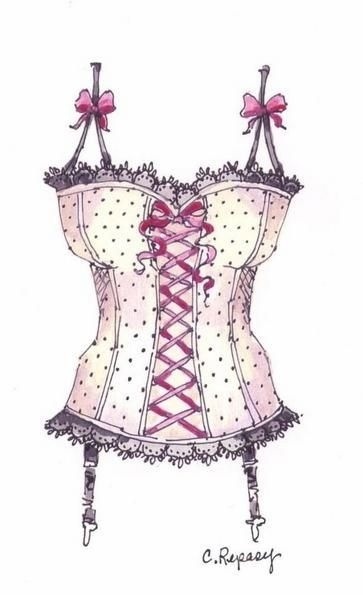 Now that you know a little of the history of the brand, lets get down to the "nitty-gritty". 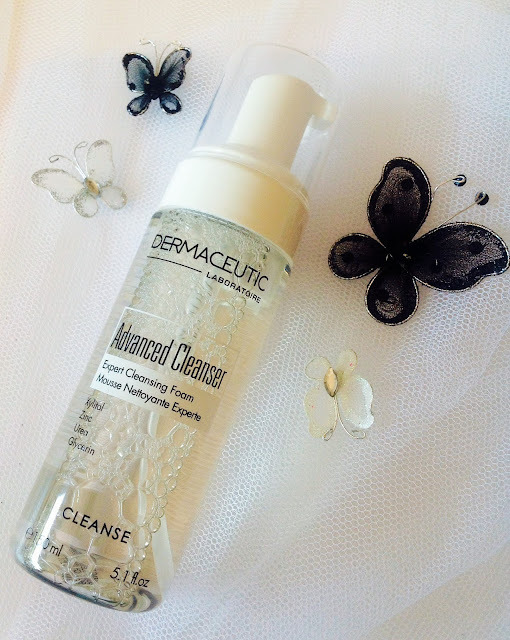 I was recently sent their newly launched Advanced Cleanser,which comes in a foam format and is recommended for all skin types, including sensitive and dehydrated skin. Having been a cleansing milk type of person for many years, it really has taken me some time to come around to the idea of using a rinseable liquid type cleanser. I have really enjoyed a couple over the last few years and, you could say that I am becoming somewhat of a convert! 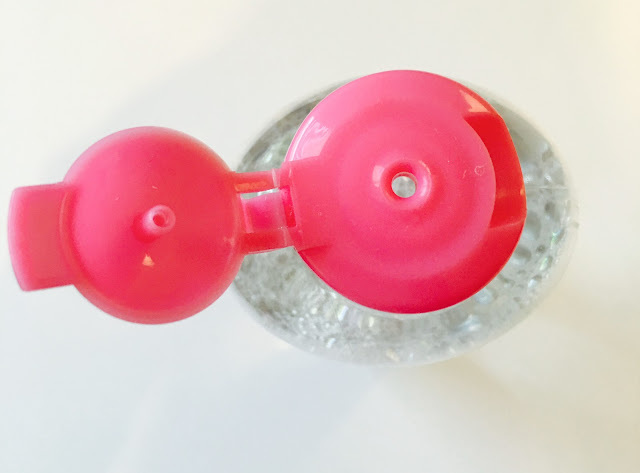 The transparent container that the foam comes in, fitted comfortably into my palm and is really easy to use with one hand and a bonus - you are able to see exactly how product much you are using. Just a word of warning - you really don't need very much of this fragrance free cleanser, so don't be tempted to pump out too much of the product! Application is easy just apply the foam onto a wet skin, massage thoroughly then rinse with water. I found this foam cleanser effectively removed my heavy make-up and left my skin feeling clean, fresh and surprisingly hydrated and balanced, as opposed to leaving a feeling of tightness. All this thanks to a unique hydrating complex that helps keep skin soft, supple and comfortable. Another aspect that I enjoyed about this foam cleanser - its Paraben free and packaged in an airless bottle to ensure optimum hygiene and a minimal concentration of preservatives. "becoming a convert" to "converted". 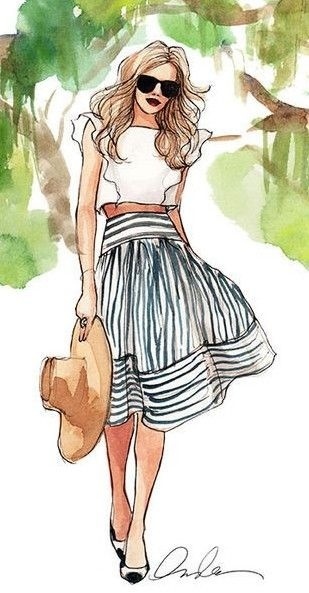 SUNDAY SKETCHES - OH LA LA! 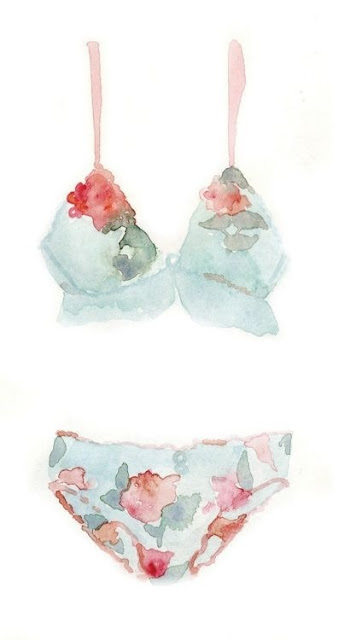 This weeks Sunday Sketches showcase some pretty underwear, I would have to opt for the pink set. 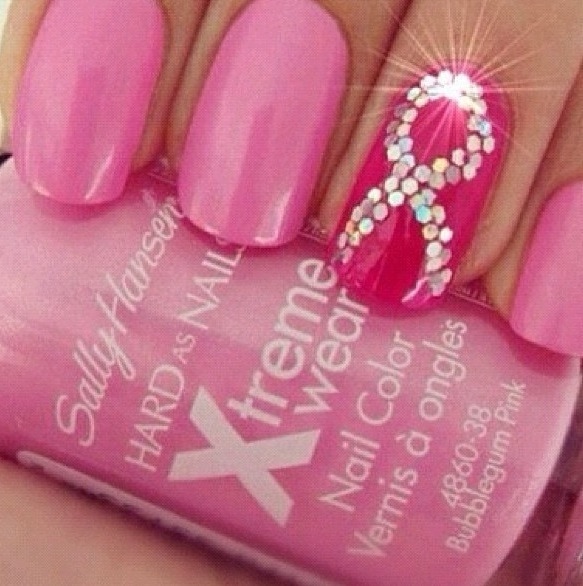 Worldwide October is Breast Cancer awareness month and I came across these pics showing you some cute ideas on how to show your support via your nails. 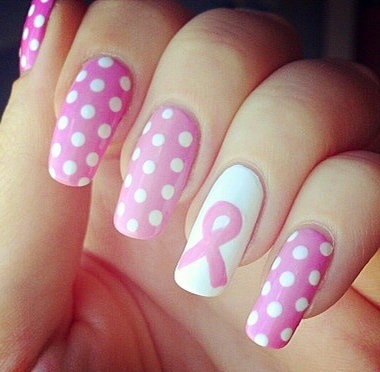 To become more aware of breast cancer please visit CANSA’s website as their purpose is to lead the fight against cancer in South Africa. 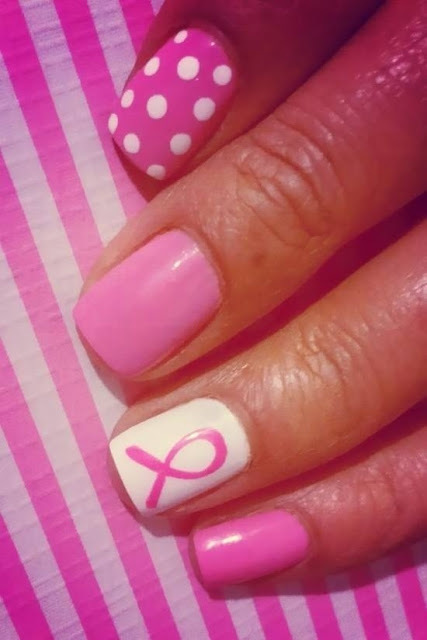 Its mission is to be the preferred non-profit organisation that enables research,educates the public and provides support to all people affected by cancer. MONDAY'S "MOVE IN" OR "MOVE ON"
"Move In" or "Move On"? First up is a product that I love, but unfortunately it will be moving on. 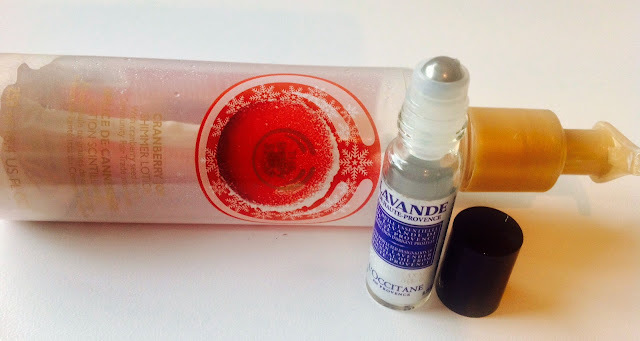 The L'Occitane Lavender Relaxing Roll-On is such a great idea, as its an "on the go", apply anytime,anywhere,calming, relaxing fragranced roll on, but after now giving two roll-ons a try I am having to give up on this one, as I simply cannot afford to keep buying a product that evaporates so quickly. Being an oil it will always find a way to ooze out of the bottle and lid, despite me being careful to thread the cap carefully back on. It's a pity as the product was my little bottle of calm, but for me it's a packaging #fail. thankfully Christmas is just around the corner, so this is temporarily moving on, but will be hopefully be moving back in soon. However their newer hair care product offerings now have the inclusion of 2 more creating a combination of 5 Essential Oils. I tried the nourishing Radiance and Colour Care Mask sample, which is aimed to help enhance and preserve the brilliance of colour-treated hair. Hair colour fade is a problem experienced by many and I feel particularly more so in summer, especially here in South Africa or any other sunny clime. All the formula's combine 5 protective essential oils (geranium, rosemary, cedar, palmarosa and bergamot) with a protective grape seed extract to help prevent colour from fading while preserving its radiance. Its claimed that hair is left smoother, softer, shinier and easier to manage without being weighed down. Having always used serums and masks to counteract the damaging effects of many years of highlighting and colouring my hair, I recently put my hair on a "Detox", so I am particularly interested to see if this mask leaves my hair feeling weighed down or not. I left the slightly fragranced, white, rich, creamy mask on my hair for the required 10 minutes post shampooing. Often it's at the rinse stage where I can usually feel whether the product is going to weigh my hair down or not, as for me it's all in the ease of rinsing and this mask was relatively quick and easy to rinse off. After combing through I followed my usual routine of blow drying and straightened my hair, at this point I was wondering what was I going to report about, that was any different to many other hair masks that I have tried. Once I had finished my styling all was revealed, as my hair felt not only smoother and hence softer, but had a radiance and shine that I can't say I have experienced before. Another benefit was the volume that my hair had, which I can only put down to the fact that the individual shafts of the hair are not coated with the smoothing ingredients, as with many products out there that claim to smooth, soften and give shine. Above all my hair didn't feel weighed down at all, so for me this was a success! I recently did a review, which did weigh my hair down all in the pursuit of smoothness. which would last me a long, long time. 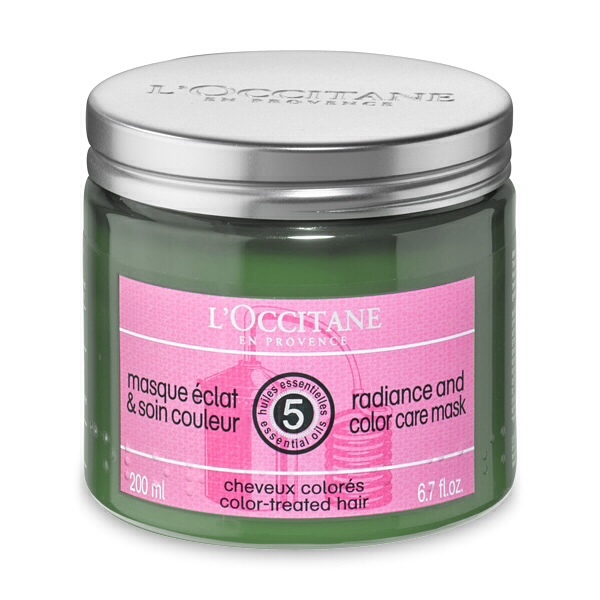 Let me know if you have tried any of the L'Occitane hair products. I can't believe we are entering the last quarter of the year and here are a couple of my standout "faves" from September. I am still really enjoying this MAC lipstick for its staying power and I've plans to try other MAC products really soon. 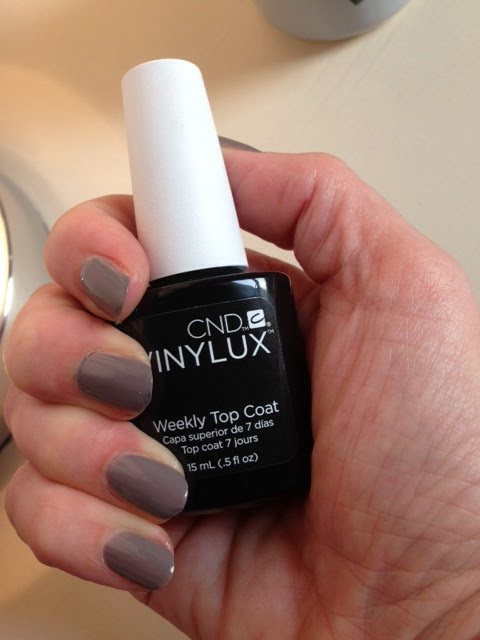 This CND VINYLUX Weekly Top Coat has become a firm part of my home mani sessions.